Replace kingroot with supersu: Hi Guys, This is the very easiest Guide for Replace / Remove Kingroot/Kinguser app with Supersu / Superuser in android phones. If you Using Kingroot app in your rooted Phone, then you may have using Kingroot or Kinguser app in your Android Phone. Rooting Android device is normal nowadays, As you all knows that this process will unlocks your Android Phone Fully, After this you can access all internal features/ Files with this, But after the Rooting you Will get the access to the Superuser, It is something whose permission are required whenever you tries to make changes in Root your Device. In Some conditions, kingroot app is not performing Properly for gain root access to some apps in your device. previously, We were shared top apps for rooted android phone. So for some reasons, if you want to Change Kingroot to supersu, then you can follow below easy guide. If your Device is MTK, then you need To root your Device with the help of Kingroot. As you know, kingroot have some compatible issues with some apps, and it is don’t have all features which must be in a root controller app. So if you really want to switch from Kingroot to supersu, then you can follow below step by steps Procedure of Full Guide easily. You will be able to Install Supersu in your Device, and you can remove kingroot in future if you need. We have added 2 Different Methods for change kingroot to supersu easily in 1 minute. Checkout all methods now from below. And give a root permission properly without facing any problem. This Easy Method will 100% Working in Almost all android phones, without PC. you can Simply Remove Supersu & Install Kingroot instead in your phone with this Guide. Many people are always looking for replace kingroot & use super su over the internet. If you are also trying to install super su app from Google Play Store, then it will ask you to update su binary, unfortunately, it will not work so Trying will be worst for you. so you need CWM or any other Custom recovery for flash Super su zip. But in many android phones, development level is low, so custom recovery is not available for every android phone. So this guide, is specially created for those users who’s doesn’t likes Kingroot because it’s kind of unknown app so nobody trust on it. So, This is the Main Reason behind replacing Kinguser with Superuser, No one wants to give permission to any unknown app to access their own device root access. Check it out now from below. also checkout some cool Whatsapp Tricks, for use whatsapp in more good way. You can replace kingroot and use supersu on your phone right now with the guide I have mentioned below. So simply have a look at below now from below that how it can be done. Supersu is complicate with almost all apps, in android. And kingroot may case some issues With Some apps, while giving root permissions to apps. Like, we was experimenting with Hide my root app, when i was tried to Hide su binary, then it was showed an error message, like Hide Su Binary failed. So I was replaced Kingroot with supersu then it was worked completely fine. before i am not able to Hide my Root in Android phone after that i’m able to hide as well Hidemyroot too. So in some cases, Supersu is better than kingroot. checkout some basic requirements for use this guide. This is the one of the best, and safer way for replacing kingroot with supersu in your device, and you will be able to use supersu in your device without any issues with below tutorial. So guys Download kingroot superuser apk from This article for replace superuser with supersu. Kingroot is not liked by many people and is a kind of unknown app, people don’t trust that app. Hence, not able to trust become one important reason why people want to remove or wanna get rid of the kingroot (KingUser). So that I Decided to shift Kingroot’s KingUser to SuperSu. Well, there are different ways of replacing Kingroot with SuperSU. So let’s begin any method Out of 2 Easy Methods. 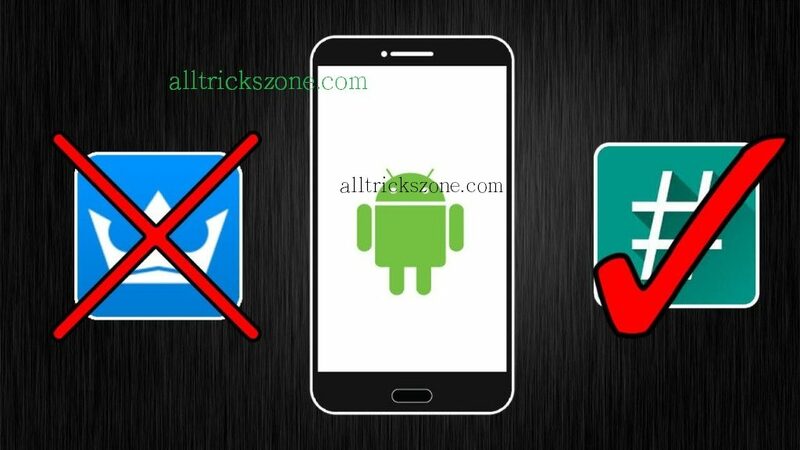 Give it try – Easy Method on How to Change Android Id. So, Do you wanna know How to Replace Kingroot with SuperSu? and really want to remove kingroot from your phone, and want to use Supersu instead, then you need some things ready, which i have mentioned in below Link. in this guide, You will learn all About How to remove/replace Kingroot/ Kinguser with SuperSu/Superuser app in any Android Phone. So, Easily Checkout some of the requirements, before you replace kingroot with Supersu easily. Now give a try if you want that How to completely remove kingroot. For using this app, you need terminal emulator app in you device. This method is working in most of the android devices. This method is only for some of the basic / advanced uses of android, If you are newbie, then you have to use Alternate method, Which is mentioned after this post. That’it guys it is the first & one of the best Easiest trick to Replace Kingroot with SuperSU, If this will not work for you then you can try out my second easy Full Method below. Also Look – Spotify Premium App for offline music. First of All, Install Terminal Emulator in your Android Phone, if you haven’t installed it already. After Enter above Command, it will ask you for Root permissions, Allow Grant Root permissions & Enter below command. Also checkout one alternate method from below for How to Remove Kingroot and Install SuperSu, if you have any issues, while using this guide. Previously, we was shared How to Unblock Sites in Android Phone. You can Follow above Simple Guide, and it will work for sure, we have also tested it and working completely fine for me. So You can Easily You may Also like WhatsApp Dp Collection for make your Whatsapp profile Picture amazing. Follow Step by step Guide, and it will work. If you have some issues with kingroot / kinguser app, or you don’t like this app, and want to replace it and install Supersu in your Device, then This Tutorial is also Specially For you you can also replace SuperSu to Kingroot. Also Have a look at Latest Enable Whatsapp Chat Heads without root, For Chat with whatsapp friends without opening app. You can Simply Drop a Comment below, if you have any kind of issues while following this Guide Cause i am here to solve your problem. While following this easy guide Some users are reporting me that their Android Device stucked on boot logo after follow this easy Tutorial, So please keep a stock ROM ready with you in case of anything goes wrong with your device, then you can easily Flash Stock Rom, This message for those who searches on internet that My Mobile is Bricked, Dead, How to Flash ROM. for all kind of Android Font. This Tutorial is Specially for those, who don’t want to use codes, and for newbie. This Tutorial will work for sure, it’s apk method for replace kingroot with supersu. Also Checkout How to Change Boot Animation in Android, for Enjoy Custom animation in Android phone. Then, After successfully install, just open it, & it will ask you for root permissions, click on Grant button, which will give superuser permissions to this app. so let’s continue to next steps. It will start replacing Kingroot with supersu , it will take about 1 minute to complete process, it may take more time, if your phone’s performance is low, wait some time and let it be done. maximum it will take 2-3 minutes for complete the process. This was my One of the Best Easy Gguide on replace kingroot with supersu xda guide, for delete kingroot from your device, and use supersu in it. Supersu me apk is one of the best way for replace kingroot with supersu easily. Supersu is far better that kingroot in all conditions. Kingroot shows Chinese language, which is not able to understand by every person Lol. So you have to Replace kingroot in your Phone, and use Supersu instead of Kingroot. 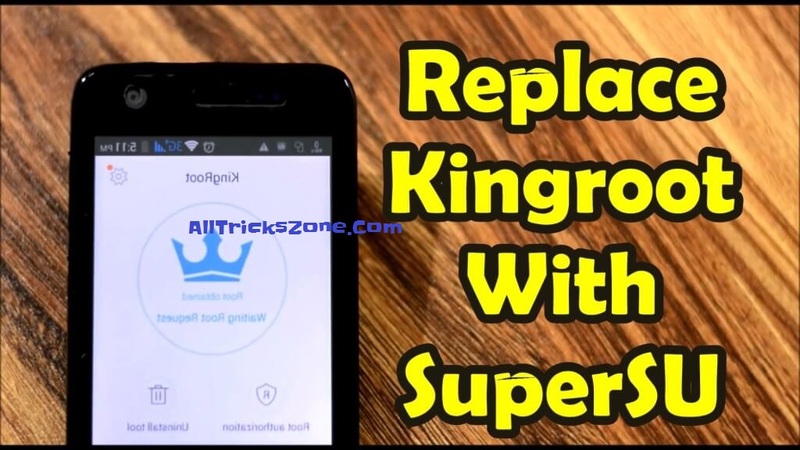 here is the video tutorial, which you can follow for replacing kingroot with supersu, with the help of simply Supersu app in your android device, There are also some other methods available, but this method is the one of the best and easy method ever. So, if you have any confusion, while follow this guide, then checkout video guide now from below. Important Note – This Guide is tested by me on Intex Aqua star 5.0. So you may try this guide at your own risk. i am not responsible for anything wrong happen with your device. If you have any issues, or needed help then feel free to comment below. i will try my best to help you but not responsible for your device. So Guys, this was the complete guide on how to replace kingroot and use supersu. now don’t use any Chinese app, for manage root permissions in your android. also check Increase Ram in Android phone. you may try out this method once, if you are facing any issues while using kingroot app. many of the users are using kingroot and sometimes it create issues in phones. so checkout this guide for replace kingroot and use supersu app in your phone. Just use branded Supersu app, which is very best and popular for every android phone.also have a look at How to Change Mac Address in Android. That’s it guys this was the easiest tutorial, for How to Replace Kingroot app with super su. I have added 2 different methods in this post which are above, one of them will surely work for you without any issues. You must checkout the Guide for How to use WiFi Kill app for kill friend WiFi Connection and prank with them. There are also so many apps, which can root your android phone like iroot, kingroot etc. Some people, root their phone with Kingroot, & later they wants to use supersu and not able to grant root permission so this guide specially for you. So let’s check it out now. replace kingroot with supersu. Not working brother I have tried both of methods.